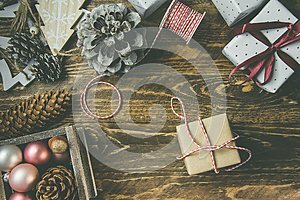 Flat lay on rustic aged wood background, Christmas or New Years gits wrapped in craft brown and white paper. Ribbon, twine, pine cones, baubles, ornaments. Kinfolk hygge style.